Recognized worldwide as the highest quality commercial and home chocolate fountains. Watch this video for a quick look at the superior quality of Sephra. Our chocolate fountains run quietly and deliver a beautiful cascade of chocolate. We offer four models of chocolate fountains for commercial use, three models of home chocolate fountains for entertaining your friends and family and our special Sephra Chocolate for chocolate fountains. Sephra chocolate fondue was specifically created to flow perfectly without the addition of oil to the chocolate. We take great pride in providing our customers with a wonderful experience using our Sephra Chocolate Fountains and our delicious Sephra Chocolate for chocolate fountains, pastries, baking and eating! We have had fun creating the Sephra chocolate fountain line of products and wanted the company to have a story and image associated with the historical richness of chocolate. To this end we created the Legend of Sephra, a balance of chocolate fact and fiction. We invite you to take a moment to read the Legend and decide for yourself what is fact and what is fiction. 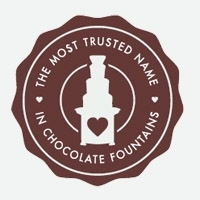 In researching the history of chocolate and creating the Legend of Sephra, we decided to name our chocolate fountains after names associated with the Aztec Nation. The Aztecs, as history records, were the first people who highly valued the cocoa bean and deemed the chocolate drink they created to be the "Drink of the Gods".We now offer five different sizes of commercial chocolate fountains ranging from 54 inches in height to 23 inches. The names are respectively: The Amazon, The Sephra, The Montezuma, The Aztec and The Cortez. In addition to our innovative chocolate fountains, we were the first to develop a couverture fountain ready chocolate. This was in stark contrast to the previous standard of adding vegetable oil which destroys the taste and is terribly messy. Our chocolate recipes boast a velvet smooth texture, intensely rich flavor and wonderful aroma. We also introduced the 2 lb microwaveable bag so caterers could easily melt the chocolate quickly and without the mess of large bowls. These bags also reduced waste as the caterer could easily add chocolate during the event in 2lb increments as needed. These bags also ensured unused chocolate would maintain its quality during storage. In addition to our commercial line of chocolate fountains, Sephra has created a line of consumer chocolate fountains. Our Sephra home fountains are unequaled in quality and are designed to provide hours of enjoyment over the years. Because of the strength of the Sephra motor and our patented design features, the flow of chocolate in our fountains is perfect, creating a full curtain of chocolate cascading over the tiers. Regardless of the event, the chocolate fountain quickly becomes the gathering place for memories to be shared and made. Our fountains are now distributed throughout the world and we take pride in serving the distinct and individual needs of our customers across the globe. Each customer is extremely important to us and represents someone using our products to advance their economic welfare, increase their standard of living, or to create fond memories with family and friends. We welcome you to become part of the Sephra family.